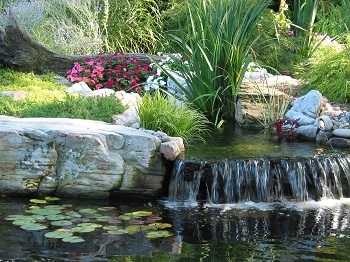 At Nature's Re-Creations, we offer pond maintenance to all of our water features as a service to our customers to guarantee a beautiful feature year after year. Although our ecosystem is very low maintenance, some work is involved to properly maintain your water garden. We offer Fall or Spring clean-outs that consist of a 1-3 man crew (based upon size of pond) that drain your water feature with a clean-out pump. The clean-outs include a power wash of the entire water feature, removing any dead or unwanted debris and algae build up, component replacement and water treatments. Your fish, if any, will be transferred with care and caution to a separate holding tank that is covered and aerated. We will then ensure all the liner is covered and all underwater lights are working correctly. We then refill your pond and dechlorinate the water in order to properly re-acclimate your fish back into the pond. Once your pond is back up and running we provide you with new beneficial bacteria and any other necessary products to get you ready for a new season of water gardening. The frequency of our pond maintenance can vary depending on the type of water feature or our client's desires. Most choose to have us service their water feature monthly, but some request bi-weekly (or about 2 times per month) to allow for more visits and less work on their part. However, if you are more of a hands-off type of person or have a busy lifestyle, we do offer routine pond maintenance services to keep your feature looking its' best all season long. All of our pond maintenance is done on a time and materials basis. A typical clean-out can range anywhere from $250 to $2,500. It all depends on how well things were maintained throughout the season and how large the water system. Throughout the rest of the season, our water features are fairly easy to maintain. An occasional beneficial bacterial treatment and skimmer net cleaning may be needed every once and a while, but the rest of the time may be spent just sitting back and enjoying the wonders of your natural water garden. Contact us to inquire about these services at (636) 223-2330.